Dinner, brought to you by JS. The time to make this dinner: approximately 45 minutes, but that's because I'm not that fast. I was running late all afternoon, with work and errands, and had to come home in time to make dinner. I did not even have anything in the fridge to make dinner with. So, on the way home, we stopped by our regular Chinese supermarkets for our selection of entrees. I saw some beautiful wild sockeye salmon and knew that these were going to be our dinner tonight. Side note: I am terribly frustrated by the lack of wild sockeye this year -- and we are in Vancouver, BC, for heaven's sake! This is the first time I've had wild sockeye this season, and yes, I am getting angry at the state of our fisheries and how we've managed to bring them to the brink of destruction. Hopefully, next year will be better. I heard on the radio the other day that the sockeye that is sold this season is sockeye from Russia. Either way, there is a very limited supply of sockeye, so if you see sockeye, grab it! By the way, I don't know if these sockeye steaks are from Russia. Our superduperconvenient Chinese supermarkets (T&T and Osaka, which are the same thing) do not usually carry sockeye and this is just the first or second time I've seen sockeye in their displays. I'm hoping that they might be wild BC sockeye, but in any case, BC or Russia, these salmon steaks were delicious. I adore sockeye salmon, and one bite into these steaks, I suddenly remember what I've been missing for the whole year. I like my sockeye to be simply prepared. Usually, I will just throw them on the grill with some olive oil, lemon, salt and pepper, but given the limited time I had, I decided to do them on the stovetop instead. I slathered on whole grain mustard, sprinkled salt and pepper, on the steaks and seared them on medium heat in some olive oil until a crust forms. Repeat on the other side. 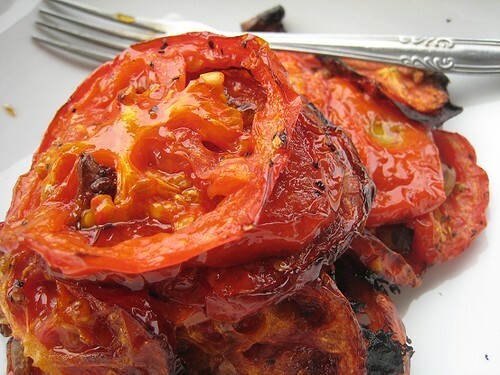 As side dishes, I sliced some tomatoes thinly, as thinly as I could with a dull knife, and roasted them in the oven. I did not get to use all of the tomatoes I had intended to slow-roast, because slow-roasting all of them would have taken more time than we had before the troops mutinied, so I decided to do a quick tomato sauce with white beans. I chopped and seeded the tomatoes and then put them in a pot with olive oil, garlic, and pancetta. The white beans I used were just regular canned white beans. I added some thyme to flavour the beans. A couple of lemon wedges to sprinkle on the salmon. 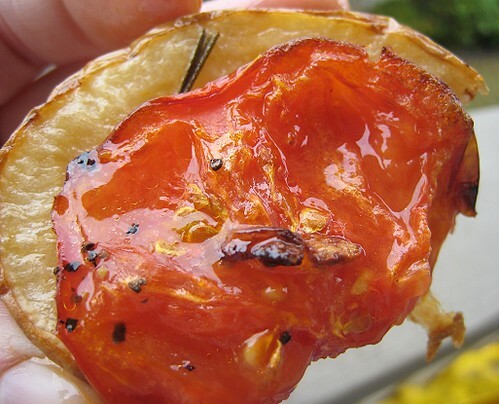 The slow-roast tomatoes on top of the potato discs were fabulous eaten together, on their own. 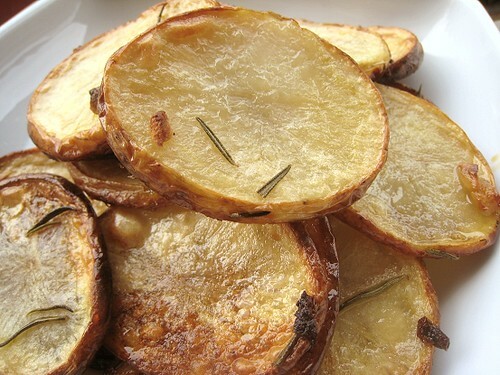 Here's another shot of the potatoes, just because they're soooo good-lookin'! I never thought of coating fish with mustard the same way I do beef steaks. I'm going to try that. Yeeey, I'm the first commenter!! Look at that hearty meal! 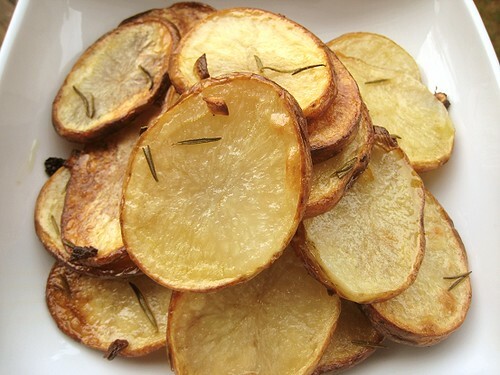 I did similar to my potatoes recently too, with rosemary! They were good! great pics...and um, i see we both made salmon - lol. Mine wasn't sockeye though...but it was damn good. Those pics...wow, those pics are wonderful! I love every element of this dish, well done! This looks really great. 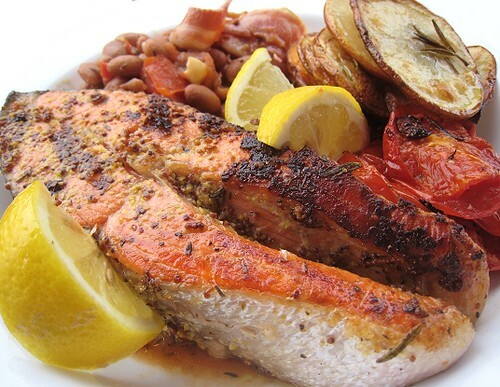 I love salmon, tomatoes, potatoes, and beans. Wow, great! Nice pictures as well, as always! All the componets of that meal sing to me. We held a Sockeye Dinner Party last March where 4 out of 5 courses were salmon.We had the fisherman from Alaska in attendance. It was just fabulous. I did not know about the lack of wild sockeye. I'll have to look into that. 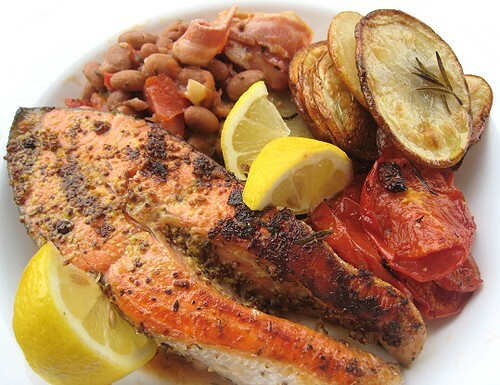 I'm craving salmon and the potatoes and tomatoes together look delicious! This looks like a great meal. your pix always make me "ooohh and aaaahhhh"! !..what a lovely way to make salmon! 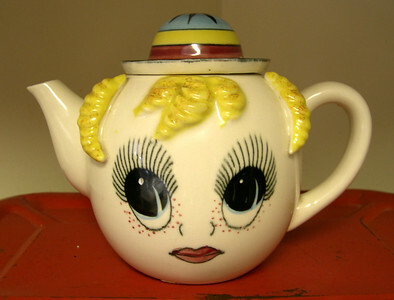 !.I have something for you ,hop over my kitchen!! I wish I loved salmon, I really do, especially when it looks as lovely as yours! But Lordy those tomatoes and potatoes? I'm soooo in! Yummy indeed. I heard that next year will be a better year for salmon. I'm not sure about the sockeye variety though. Looks like a great meal!! This looks great! I wasn't aware of the problem with wild sockeye - I live in Boston. It's supposed to be hard to get here! I like the tomatoes and potatoes too - just looking at them is making me hungry. That is one tasty looking meal! We;ve nver tried having raw salmon at home. Always in a restaurant. Hehe. And hey -- cornmeal-crusted anything is good! Yup, sockeye is a type of salmon. Its flesh is really red, not just a pale "orange". Ever since I was brought to Florida (and then divorced by my fourth ex-husband), I have taken a liking to Sockeye salmon, especially with an Italian twist. Of course, I am an Italian immigrant, as well as a PROFESSIONAL CHEF educated at Peter Kump's Culinary School in my hometown of Brooklyn. But I can tell you, as the SENIOR ADVISER at Serious eats, that I am truly impressed with your post. You can bet that my boyfriend "BigBear" will be giving me some special loving after I prepare this delicious dish for him. Just the title of the post is enough to make me want this! That sounds awesome, I wish someone would make that for me tonight! Looks great - I always love potatoes and tomatoes together. So many of my favorite things on one plate, everything looks delicious! How long and what temperature for the tomatoes and potatoes? They look delicious! JS had the oven at 400 degrees F for both the tomatoes and potatoes. Since the potatoes were sliced so thin, she checked them at 20 minutes first... and every 5 minutes after. The tomatoes took longer. She checked at 30 minutes... and again in intervals after that. Hope that helps!